The following represents many of the most frequently asked questions regarding installation and operation of the PTC Model III Indexing System. Of course, if you have a question not addressed here, please feel welcome to call or email. WHY DOES MY SYSTEM LOSE ITS POSITIONS? WHICH TRACK SELECTOR SHOULD I USE? WHAT IS THE DIFFERENCE BETWEEN "REPROGRAMMING" and "RE-INDEXING"? POWER SUPPLYS OUTSIDE THE U.S.
Q: Why does my system lose its memory? A: In older systems, namely if they are a keypad with version 8.5 or less, or rotary and pushbutton with version 7.6 or less, we can perform a modification to cure it. Contact us! Q: What does your system use to index (what kind of switches or sensors)? A: This is an important point: no sensors are used! The PTC Model III is unique in that is does not use mechanical or optical sensors of any kind, and therefore, much easier to install. There is no need to build or mount sensor brackets, sensors, or any of the associated hardware and wiring. As a result, the system is completely maintenance free. Q: Do I need any programming skill to program the system? Do I need to use a PC? A: No. All programming is done through the standard operating controls-and no actual "programming" experience is needed. Programming takes about 5 to 10 minutes, depending on the number of tracks you have. Q: You have several Track Selector Modules available... how do I choose which one is best for me? - We highly recommend the Keypad Selector for all applications. The Keypad selector has the added “pizzazz” of being more ‘hi-tech’ looking, and comes supplied with a 12 key keypad and dual digit display for output of more detailed user information. It also comes with an integrated face plate included. In addition, the Keypad Selector has the added convenience of enabling the operator to change speed, momentum, and ATR modes from the operating keypad, rather than by DIP switches on the controller as is the case with the Rotary, Pushbutton, and Chubb/Universal selectors. - If you have less than 12 tracks to index, then the standard Rotary or Pushbutton Selectors will be your least expensive choice. The Rotary is the easier to install than the pushbutton, and is the most intuitive to operate. The pushbutton has too many wires for our taste. The Pushbutton Selector is designed to work with an array of discrete momentary pushbuttons, one for each track. With the Pushbutton selector, you supply your own momentary pushbuttons, or purchase NYRS Switch Packs (four switches per pack). (c) If you have an existing 24 position rotary switch (like the double stack rotary switch supplied by Diamond Scale) and you want to use it with the PTC. WHAT IS THE DIFFERENCE BETWEEN "REPROGRAMMING" and "RE-INDEXING?" Q: I have downloaded and read the user manuals for your system. You reference a procedure you call "re-indexing". Is this the same as re-programming? A: No; reindexing is really just resetting the orientation of your turntable bridge back to its origin, or in other words, bringing the head end of the bridge back to its reference location. Typically, you will reindex the bridge after an unusual event, such as servicing your bridge or something like that. You would only need to reprogram the system if you added new tracks later. Q: Does power need to be "on" all the time to keep the programming stored? A: No, the system uses a non-volatile memory. Q: Can the system be reprogrammed later, if I add or remove more tracks? A: Yes, simply put the system in "Learn Mode" and have at it. Q: Do you have any information on reliability of your system components? A: Nothing formal. However, only new, first quality (name branded) components are used. No factory overstocks, surplus, etc. components are used. A: Approximately +/- 0.010 degrees, based on a step angle of 0.025 degrees. Of course, your bridge may flex more or less. For example, if your bridge is of metal design or is otherwise a well-made bridge, accuracy and repeatability will probably be greater. 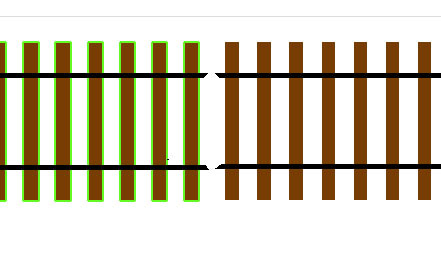 To put these figures in perspective: on an 18" HO bridge, there are approximately 8-10 steps per rail width, so this fraction of a step error will not likely even be perceptible. Your bridge will be completely aligned, for all practical operating purposes. Q: How is your system warranted? A: Your system is fully warranted for a full year, including parts, labor, and return shipping reimbursement if warranty service is provided. Q: Is the motor electrically isolated from the motor shaft? I used the motor shaft to conduct current to the bridge rails. A: Yes. The motor body, gear body, and motor shaft are not insulated from each other; however, the motor windings do "float" and are isolated with respect to the motor body (and therefore, the motor shaft). Q: Is the PTC Model III compatible with my DCC System? A: Yes. The PTC does not interfere with the use of any DCC systems. Q: I use the layout automation technology invented by Bruce Chubb. Can the PTC be used with it? It seems like connecting the Pushbutton Selector to the relay output module would work. A: Yes, the PTC has been installed and used this way, and there is now available a new Chubb/Universal Track Selector and Application Note available (downloadable from our downloads page at http://www.nyrs.com/downloads.htm ) to help you with this. Being mindfull or a few operating constraints, it is possible to install both the Chubb/Universal Track Selector and use the conventional Track Selector front-panel mounted controls and/or the remote Chubb PC control at the same time. This lets a local operator at the roundhouse control the turntable, if desired. Q: The Rotary and Pushbutton TrackSelectors have a Head/Tail Switch to indicate which end of the bridge you want to orient when operating. How do you indicate Head/Tail on the Keypad Track Selector? A: The keypad selector does not utilize a head/tail switch. Instead, the keypad head or tail indication is entered using the keypad "#" and "*" keys. During operation, you identify the track alignement by typing "#", the track number you want, then "#" or "*" for head or tail end of the bridge respectively. "*" (to indicate the tail end of the bridge needs to be aligned there). The controller will then do the 180 move, bringing the tail end of the bridge into alignment with the lead track. Q: I have an older turntable with a wooden wheel with rubber tipped motor turning it. The round house and track is already installed, as is the lead-out track. There are 18 slots for the engines in and outside the roundhouse, with still additional space on one side of the lead-out track. Question: Since this is already installed, will your indexing system still work ? If so, what modifications - if any - would be required ? A: Yes, if the turntable shaft is extending below the turntable and is accessable for direct drive by the PTC, the system will work. The system will learn the locations of your existing tracks (you program them in), so no problem with the existing track locations. However, you will probably need to remove the large drive wheel, to accomodate the PTC Motor Mounting Bracket. Final note: Older tables sometimes have a lot of "play" or "wobble" in the center shaft bearing; this would have to checked and eliminated, if play between the shaft and center bearings is found. Q: Do you offer a discount to clubs? (3) The discount does not apply to shipping and handling. To take advantage of the discount, contact us for more information. Q: Can the PTC Model III be used on my garden railway? A: No, the PTC is not warranteed or recommended for outdoor use. Q: I have a Bowser brand turntable. Is the PTC Model III compatible with a Bowser turntable? A: Yes. Application to Bowser tables is straight forward. However, it is essential that the center turntable shaft fit snuggly and turn very closely in the center bearings-- no "play". Some Bowser turntables have had a small amount of wobble in the center shaft, producing less than perfect indexing. Review the discussion regarding Diamond Scale turntables for additional details on this subject. Q: I have the new Walthers Cornerstone Series Turntable, which does not have a shaft extending out below the bottom of the turntable drive enclosure. Can I adapt the PTC to work with this table? Q: I have a Diamond Scale turntable. Is your system compatible with my turntable? A: Yes; in fact, the Diamond Scale indexing system is the most popular one we retrofit. There are a couple of things to check with your Diamond Scale installation, however. Some Diamond Scale turntables have a small amount of "wobble" in the center shaft, plus some non-zero amount of play in the center block-to-bridge assembly, producing less than perfect indexing. These issues generally can be taken care of, to produce excellent indexing performance (see additional notes below). Q: How to I check for shaft wobble? A: The shaft wobble is usually the result of the center shaft actually being about 0.002" or more undersize (or of the shaft actually having an oval cross section) in the center shaft bearings. This is because the shaft is a piece of cold rolled steel, which sometimes appears to have variance in its "roundness". Based on customer feedback, this seems to happen in less than 10% of Diamond Scale installations, for example. You can detect this wobble by grabbing the bridge and trying to move it side-to-side and end-for-end; the slightest movement means you have excess play in the center shaft. If this needs to be corrected, replace the shaft with a new piece of 5/16" cold rolled steel rod, or drill rod if available. Q: What about the center block? A: You should check this for wobble as well, and if necessary, shim between the center block and the bridge superstructure such that there is absolutely no play between the center block and bridge structure. As you build that Diamond Scale bridge I can offer a few things that folks have problems with. #1. The shaft has to be exactly centered on the bridge. That block has some little retainers that hold it in place (centered) and if they are off the bridge may rub on one end and not the other. The Diamond-Scale pits are not as exact as they should be in holding a true circle because of the way they are made so it's sort of tough getting this one right. #2. The ring rail needs to be level or the bridge will move up and down and could be higher in some places than others. #3. The bridge has to be level. Sometimes they develop a warp and the bogie trucks don't sit flat. Like 3 wheels will be riding the rail and the fourth won't. Paying close attention to building it will help when it comes time to get it working. The PTC system has 14,400 steps in the circle, that is .025 degree resolution so it doesn't take much slop to throw it off. I also notch the inside corners of the brigde and lead track rails off with a file so if there is a little mis-alignment the wheel flange doesn't catch.. See the following illustration. Q: I have a 24 position rotary switch installed and used with my old indexing system. I have more than 12 tracks to index. Can I use it with the PTC Model III? Q. Does your system work with the Custom Model Railroads Kit? A. Absolutely. CMR designed their turntable with the PTC in mind. If you look closely at the bottom of the pit you can see 4 dimples. Drill these out to a #10 screw and countersink the hole and the motor will bolt right on with the motor shaft sticking through the bottom of the pit. Q: I have a modular layout, which I take to various shows. Should I remove the motor and bracket during shipment? A: No. Rather, it is recommended that your motor be securely mounted with the motor mount bracket bolted to wood blocks of the appropriate thickness (rather than the standard threaded rod standoffs), and not be removed and re-installed between sessions. This is primarily because it would make the installation more rugged, and because removing and re-installing the motor usually requires reprogramming the system. This is because the system is very accurate and previously learned error deviations, etc., would have to be relearned based on the motor's then current particular installation orientation. Although not really a problem, you may find doing this to be a bother. Q: I live outside the United States, and we do not have 110VAC power here. Do you supply an alternative power supply? A: Customers outside the U.S. must provide their own power supply. The supply will need to provide 12VDC at 800mA minium. We provide the power connector and wiring instructions for you to complete the installation. See the order form for additional details. Q: I have a turntable layout surface that has Homosote on top of plywood. The Basic Motor Mount Installation Instructions state that you should use a 7/32" bit if mounting into Homosote, or 1/2" if mounting into plywood. Which size bit should I use? A: Use the 7/32" bit. The Homosote tends to "give" a little when compressed, hence the smaller diameter bit. The tee nut used with the motor mount kit is sufficiently short that it won't reach through to the plywood, so drilling all the way through with the 7/32" bit will work out just fine. Q: I have a large Bowser turntable, about 30". The Basic Motor Mount Kit is only recommended for tables 18" or smaller. What do you recommend for mounting the PTC Motor? A: The PTC User's Manual includes full dimensions for building your own Motor Mount, if you are so inclined. Alternatively, the basic Motor Mount Bracket can be attached to the bottom of the turntable pit itself, instead of to the layout surface. In the case of large tables such as yours, this should be done by fixing wooden blocks of appropriate thickness to the bottom of the turntable, then using lag bolts to attache the bracket to the wooden blocks. On large tables such as these (<24"), use of the threaded rod included with the Motor Mount Kit is not recommended because the torque the motor produces to turn the large tables can sometimes overpower the rods and bend them slightly, just enough to defeat perfect indexing. If this situation applies to you, you can special order just the bare Motor Mount Bracket itself (no hardware kit) that you can use in conjunction with the your wooden blocks and lag bolts to accomplish the mounting fairly easiely. Contact us for additional details on how to special order the bracket only.